One surprising fact is that Zandvoort is, the only resort in the Netherlands with a direct train service which travels to within a couple of hundred metres of the beach making the beach at Zandvoort easy to reach by train from Amsterdam or indeed from anywhere. 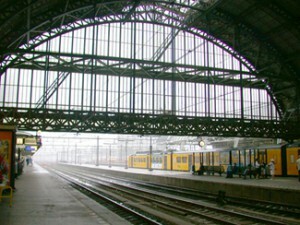 Most of the year the trains depart very regularly from Amsterdam central station with two departures direct to Zandvoort, every hour. In the busier summer months and high season this rises to 4 departures an hour. 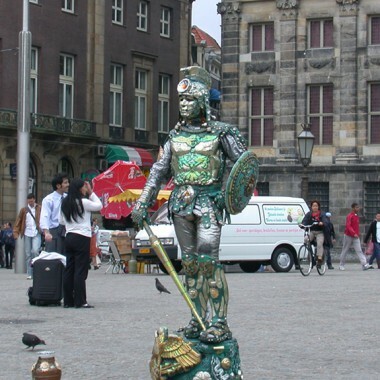 The journey time is basically only 10 min from Haarlem central station or 30 minutes from Amsterdam so it really is only a short hop! Of course the local countryside is so incredibly flat that the journey will probably be one of the smoothest train rides you will ever experience. In the summer of 2014, paper train tickets were phased out and replaced by the public transport chip card. if you don’t already have one then single use tickets which are basically paper tickets with a chip on can be purchased from vending machines. Basically you check in at the start of your journey using this chipped ticket and you check out at the end of your journey. All stations now have special posts that you can use to check in or out. Single use chip cards do not allow for discounted travel and are always full price. Also these are only available for same-day travel. Travelling to Zandvoort on the bus is pretty straightforward too. Basically there are two bus services to Zandvoort, one from Haarlem whereby the journey takes around 30 min (bus number 81) and the second from Amsterdam Marnixstraat. From Amsterdam the journey time is around 45 min or so (bus number 80). If you don’t have a chip card when you begin your journey then you can buy a single ticket from the bus driver but he will expect to be paid in cash and will not be carrying a lot of change so you need the right money! This can be bought from the Zandvoort tourist office and is essentially a day ticket for any public transport in and around Amsterdam with the exception of trains. It is valid on metros, buses and trams operated by GVB, Connexxion, Arriva and EBS. When you purchase the day ticket you are given a route map and the ticket is valid for 24-hours for any route on the map. You will activate the ticket the first time you use it and then you must check in and out with it on entering or exiting one of the modes of transport. Please note that these tickets are not valid on NS trains or buses services in Lelystad. Once you get to Zandvoort, the biggest journey you might be likely to make would-be travelling from the North Beach to the South Beach and this isn’t a problem as there is generally a bus which travels right along the seafront boulevards especially in the high season. 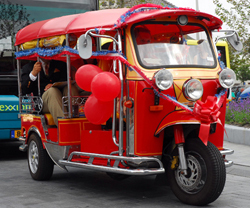 If you just want a short and fun ride around the town then there are often ‘Tuk Tuks’ which may be booked for short journeys. If biking is your thing, there are many places around Zandvoort where you can hire various kinds of bike and the flat terrain is especially suited to this mode of transport of which the Dutch are particularly fond.